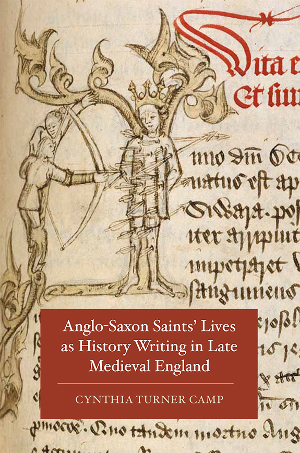 Anglo-Saxon Saints' Lives as History Writing in Late Medieval England. D.S. Brewer, 2015. "The Temporal Excesses of Dead Flesh." A post-print version of the article is available. This is a post-peer-review, pre-copyedit version of an article published in postmedieval. The definitive publisher-authenticated version, postmedieval 4.4 (Dec. 2013):416-426, is available online at dx.doi.org/10.1057/pmed.2013.29. "Spatial Memory, Historiographic Fantasy, and the Touch of the Past in the Middle English St Erkenwald." New Literary History 44.3 (Summer 2013): 471-491. dx.doi.org/10.1353/nlh.2013.0023. "Osbern Bokenham and the House of York Revisited." Viator 44.1 (Spring 2013): 327-52. dx.doi.org/10.1484/J.VIATOR.1.103153. "Plotting Chester on the National Map: Richard Pynson's 1521 printing of Henry Bradshaw's Life of Saint Werburge.” Mapping the Medieval City: Space, Place and Identity in Chester c. 1200-1500, ed. C.A. Clarke. Cardiff: University of Wales Press, 2011. 131-48. "Inventing the Past in Henry Bradshaw's Life of St Werburge." Exemplaria 23.3 (2011): 244-267. dx.doi.org/10.1179/174963111X13009808981839.